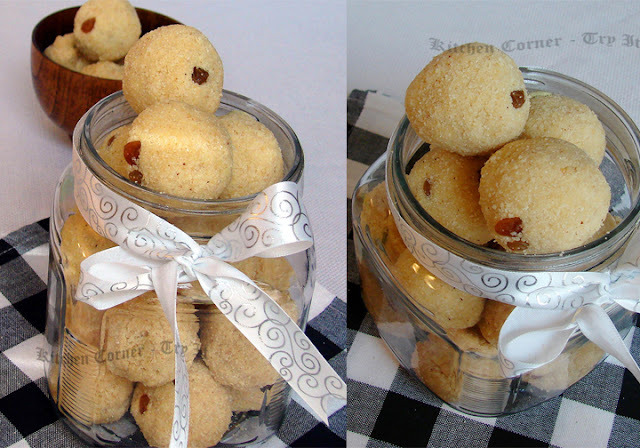 A quick and delicious ladoo any festive occasion or to satisfy your sweet craving. It is rich and extremely flavorful with roasted semolina/rava and khoya. I have earlier posted a rava ladoo,it is an instant recipe. Rava ladoo is a family favorite and I make it often.So this time tweaked a little by adding some khoya and it turned out very delicious. Another variation to khoya ladoos is adding roasted and powdered sesame seeds or adding coconut instead rava/semolina. Heat 2 tsp of ghee in a pan and slightly roast chopped cashew nuts and raisins and keep aside. In the same pan roast rava/semolina till it slightly changes color to slight golden allow this to cool. Into the same pan mix ghee,milk and khoya and cook in medium flame,stir continuously till the khoya gets cooked and changes color and you get a nice aroma. This will take about four to five minutes.Add rava, sugar, cardamon powder, roasted cashew nuts and raisins and mix well and the sugar to slightly melt.Switch off the flame and allow this to cool a little, or till you are able to handle it and make small golf sized balls. Enjoy! Wow! Khoya ladoos never tasted this. But must be tasting unique and great! so so well made. planning to make it tomorrow too for Bijoya Dashami. delicious and looks so cute! Looks perfect Suja..And neat nice presentation.Loved the ribbon. Delicious rava laddo, Adipoli, pinnae adding khoya is nice. wow these look so cute!!! adding khoya brings such a nice flavor!! Beautifull balls, addition of khoya sounds seriously interesting..
You added khoya to rava ladoo! It would only make it tastier. And such perfect round ladoos. Rava ladoo with khoya looks wonderful...Its got a perfect shape...Nice presentation dear..
wow..beautiful clicks and wonderful recipe. adipoly..both are my fav..rava and khova..yumm..i am drooling here. Very tempting clicks and very perfectly done.. Adding khoya is different and would taste yum. Beautiful arrangement and love the rava ladoos! Yummy laddu's look so beautiful in your pics..